I have a serious hankering for sweet Michigan corn. Local growers report our cooler than average July translated to delayed gratification for us corn lovers; corn requires a warm summer sun to ripen. But the patience and hard work of Michigan farmers is paying off. Local corn is making its appearance at markets, roadside stands and in grocery aisles around town. It’s fun to pull back the husks and examine those juicy kernels, especially at the Farmers Market when the heat of summer and moisture of morning dew is still on the cob. In August I always make a variation on a corn and barley salad, the recipe changing according to mood and pantry. I love the texture and flavor of healthy barley, especially when paired with corn, so that ingredient never varies. Michigan corn (Carleton farm) is a bargain at Meijers this week-10 ears for 2 dollars! The garden basil needs thinning so dinnerFeed is decided. You can easily give this salad a Southwest flair by substituting cilantro for the basil and lime for the lemon. I would also add a pinch of cumin, chopped jalapeno and tablespoon of sour cream to the dressing. Later this week I will be conducting an experiment on roasting corn in the oven VS grilling corn. Stay tuned! Cook barley in salted water until tender, according to package instructions. Rub corn with oil and roast on baking sheet until nicely flecked with roasted brown kernals, about 30-35 minutes. Remove from oven and cool. Whisk together 2 tablespoons oil, lemon juice and garlic. 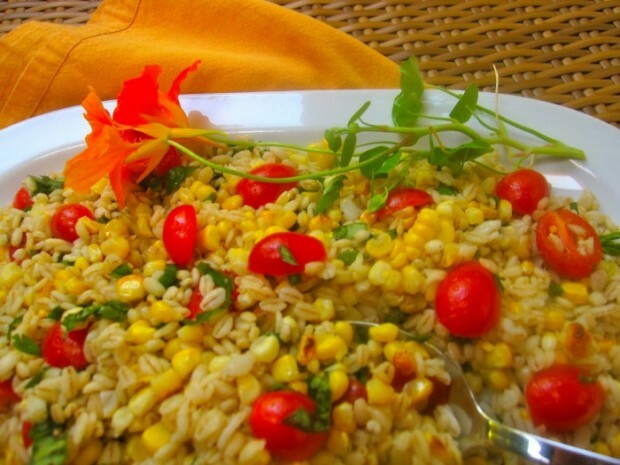 Combine roasted corn, barley,tomatoes and basil with vinaigrette. Season to taste with kosher salt and freshly ground pepper.